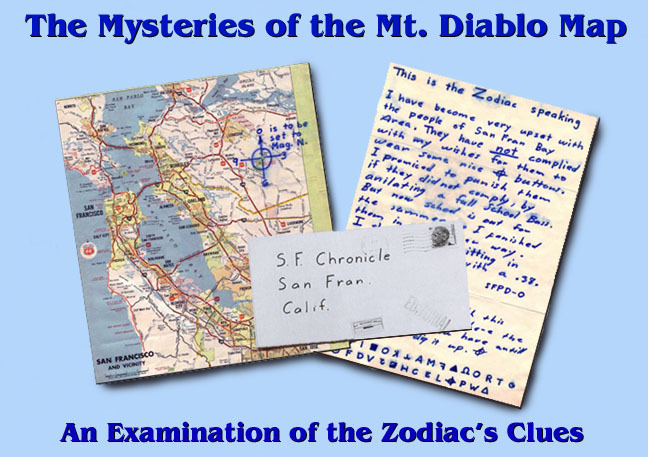 On June 26, 1970, the Zodiac sent an envelope to The San Francisco Chronicle which contained one of his most baffling and compelling clues, the infamous "Mt. Diablo" letter, accompanied by a coded message and a map of the San Francisco Bay Area. The killer used a blue ink pen to write his letters and his code. On the map, the Zodiac had drawn a crossed-circle over Mt. Diablo, taking time to leave the center of the cross incomplete so that peak of the mountain was still visible. The cross was placed over the mountain in such a manner that the four points approximated the four points of a compass, and, at each of these positions, the Zodiac had written a number; North = 0, East = 3, South = 6, and West = 9. To the right of the zero were the following words: "is to be set to Mag. N." This was an obvious reference to Magnetic North, defined as the direction to which the north-seeking pole of a magnetic compass needle points. Magnetic north is defined by the Merriam-Webster Dictionary as "the northerly direction in the earth's magnetic field indicated by the north-seeking pole of a compass needle." The magnetic force of the earth pulls the compass needle out of alignment with true north. The difference between true north and magnetic north is the angle of declination, which varies according to the location of a compass on the earth. The angle of declination from Mt. 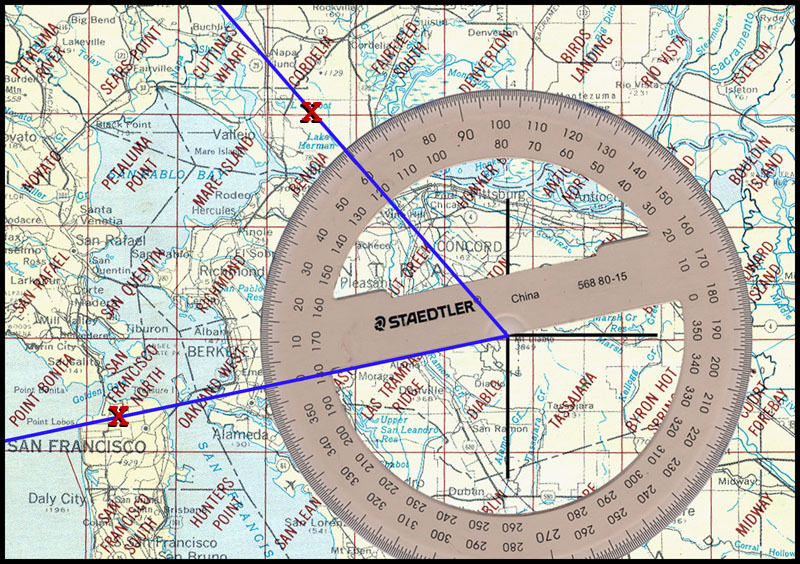 Diablo at the time the Zodiac sent his map was estimated between 16.5 and 17 degrees east of true North. The declination is occasionally adjusted as the magnetic force of the earth that causes the variation shifts and changes with the passage of time. In another letter, the Zodiac included his largest crossed-circle, which covered more than half of a page. Below this, the Zodiac had written "PS. The Mt. 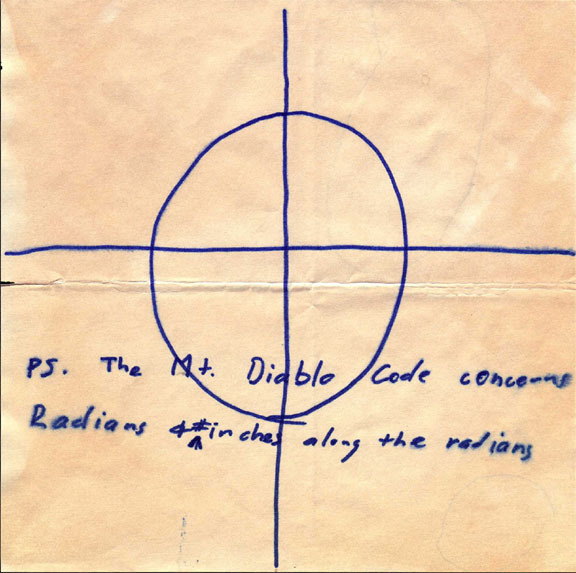 Diablo code concerns Radians & # inches along the radians." A radian is an angle valued between 57 and 58 degrees, or, 57.296, defined as "an angle subtended by an arc of a circle equal in length to the radius of a circle." The radian is the usual unit of measurement in higher mathematics, however, in applications of mathematics to surveying and navigation, the degree is more commonly used. The term "radian" is a contraction of the words "radius-angle." Radians and inches are often used to locate a specific location on a geometric plane. The Zodiac's clues may provide the solutions to the mystery of the Mt. Diablo map and code. The map was produced by the Phillips 66 company. One side of the map features Northern California, including the San Francisco Bay Area, and the other side depicts Southern California, including Los Angeles, Riverside, and Santa Barbara. 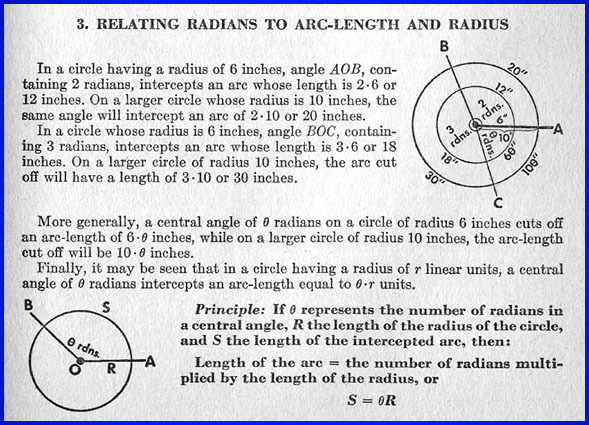 Radians and inches are used in mathematics. In astrology, several of the symbols which appear in the Zodiac's codes are used to denote various geometric angles and other astrological applications. If the Zodiac was actually attempting to give authorities the material necessary to locate a specific geographic location, he provided all of the necessary tools. The map, the Magnetic North annotation, and the instructions regarding radians and inches are all appropriate for the Zodiac's stated task, and the use of Mt. Diablo as a geographic marker and starting point suggests that the Zodiac knew exactly what he was doing. According to the website of the Mt. 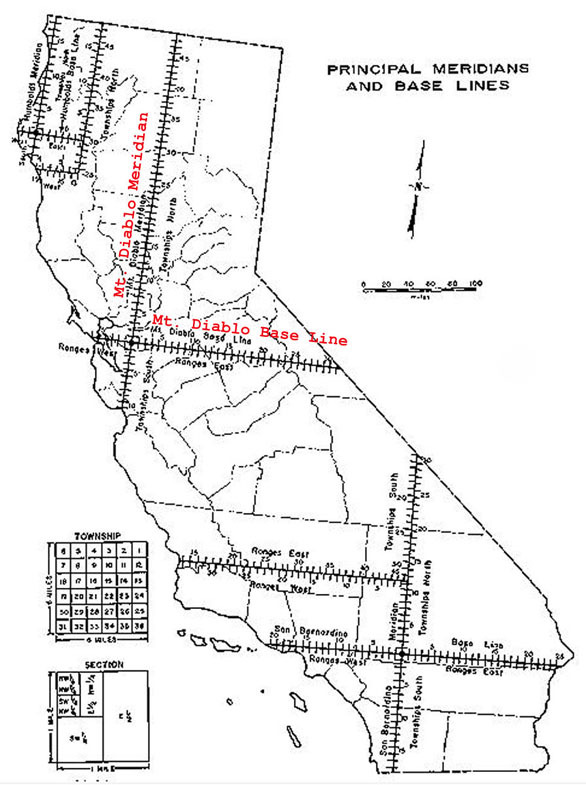 Diablo Surveyors Historical Society, "Mount Diablo is the starting point for the establishment of land boundaries throughout most of Northern California and all of Nevada. The summit is the location of the 'Initial Point,' the north/south meridian, and east/west baseline intersection point that is the basis for most property boundaries." CONTINUE WITH THE RELATED ARTICLES LINKED BELOW.